Mobile shredding services allow you to watch as the shredding is performed for the utmost security.A shred truck equipped with an industrial strength shredder drives to your location, and a shredding professional loads the documents into the shredder while you watch.This shredding service is the most convenient and secure option, because you get to watch to ensure there are no stray files left unshredded. Why Choose Mobile Shredding Services? 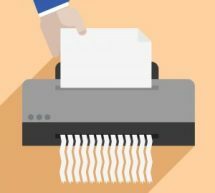 Mobile shredding services, compared to other shredding service options, offer a variety of unique benefits to help you shred your private documents safely. Hiring a shredding service provider requires releasing your private documents into the hands of another company and trusting that they handle it with care and integrity. This can be nerve racking—but mobile shredding services ease the pain by allowing you to witness the shredding process, so you know beyond a doubt that your documents were properly and thoroughly destroyed. With mobile shredding services, your contractor shows up at your door at a predetermined time, hauls your documents out to the truck for you, and shreds them within a matter of minutes. Shredding professionals safely and quickly destroy your paperwork for you, so you can focus on your day-to-day business operations. Organizations operate under strict legal regulations (and intense public pressure) to ensure they take steps to prevent data breaches and protect customer, employee, and other sensitive business information. With mobile shredding services, your company is in full compliance with all security and privacy laws, and your eyes can confirm the job was done right. For extra convenience, you can preschedule mobile shredding services so your shredder shows up on a regular basis. Shred Nations is partnered with the very best mobile shredding service providers nationwide who offer secure, reliable, and affordable mobile shredding services. To get free quotes from several providers in your area, fill out the form on the right or give us a call at (800) 747-3365.